Similar brush to the WORKER ONE, both Workers have similar size specs, the Worker Two fluffs out a little bit more compared to the Worker One, the Two’s ferrule is less pinched, so the shape is less flat. The Worker One offers more precision, more strength to pick up product and a more powerful blending, the Worker Two offers a softer and slightly less directional application, it is also dense but applies with a tiny bit more precaution. Based on the precision you require, pick the product either with the tip or the sides, tap off excess, pat, swipe or use short strokes to apply. 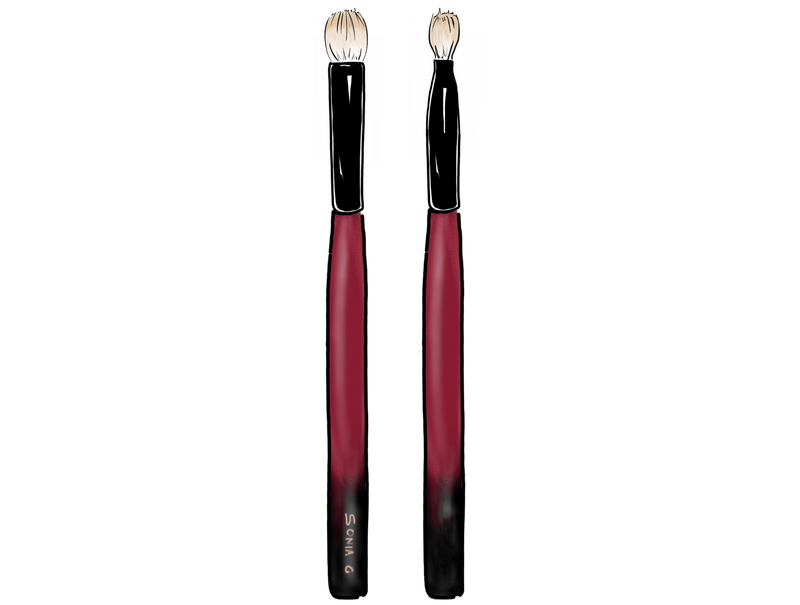 As a crease brush, place it horizontally starting in the outer crease and use short back and forth motions to apply, extend the movement as the intensity of the product decreases. Hold it an angle if you want to target blending or application to the upper or lower crease. Is it okay to spritz this brush with water or a setting spray for extra shadow intensity? And would this mean that the brush needs frequent washing since it will be used with a liquid or cream product? Thank you! Hi Denise, yes sure no problem! hugs! oh I think I forgot about the “needing more washing when used with liquids or creams” sorry! Hi, a follow on from the previous question. If used with a cream shadow, will this brush suffer from washing after every use? I purchased it firstly because of the rave reviews & secondly due being able to use it with both cream & powder. Bought this & builder 2 – they really are spectacularly beautiful brushes . Waiting for your advice regards washing after every use if using darker cream shadows. With regards to regular washing, for sure it will suffer more than a synthetic brush, by default the life span of a natural hand-made brush vs a synthetic one is shorter because these bristles are more precious materials. Synthetic bristles are more durable, I don't prefer them but for extreme heavy and daily cream use they might be better if you are looking for something truly durable. I have been washing mine very regularly and did not experience any issues, neither with staining nor with stability. They are still quite durable as these are goat, what is more fragile are the handles, like a luxury car they don't like strong ethanol -or alcohol- sprayed onto the painted handle (ferrule is ok). I am going to ask the manufacture if they advise daily washing on this brush as a daily one is quite intense, do you use cream shadows for everyday? For synthetics, I like the concealer one from Marc Jacobs, the Hourglass eye brushes are great too! also if you have access to Sephora, they have a big range of synthetic brushes that you can touch and feel therefore select the one with the best shape and size for you. When I go for synthetic to pair with creams, I tend to grab Hourglass, the price is high though for synthetic brushes made in China but the bristle selection is on point, exact same thought for Marc Jacobs (the bristle selection works really nice with creams, I find it’s a bit too much on the “sticky feeling” with powders but still ok. If you want to stay with less expensive options, get Sephora ones. Thanks very much – I’ll look into them. Sadly I’m in the UK and Sephora won’t ship here anymore.